Truth of the matter is that outside of New York City and Long Island, freight trains are an essential and an integral part of the national and global transportation network. Their prominence throughout the rest of the country is just as high-profile and important as the interstate highway system. People see freight trains on a daily basis, often spanning over 100 cars in length. Thousands of trains, carrying all types of commodities imaginable, are all in motion 24/7 connecting manufacturing plants and warehouses, cities and towns, and coast to coast all together with one another. Freight trains are a way of life in North America, and the railroad industry is thriving and only growing as fuel prices soar and rail increases its competitive cost advantage over long-haul trucking. Nationally, 15% of America's cargo is transported by rail; in New York City and Long Island (the East-of-Hudson region), that plummets to a pathetic 1% of commodities imported/exported. We cover the political and technical reasons behind this unfortunate figure in the "Issues" section of this website, but for now, let's focus on why we need freight rail, and why it is absolutely necessary to uplift a crippled New York City and Long Island. The people behind RNY have scoured all of the studies, papers, reports, Needs Assessments, Environmental Impact Statements, and other publications issued by a variety of city and state agencies, transportation planners, and logistics experts. These agencies and individuals realize and understand the transportation challenges New York City and geographic Long Island face given the existing infrastructure capacity not expanding to accommodate future increases in traffic due to a growing population and increased consumer demand. Fully integrating geographic Long Island with the national freight rail network is the only way forward. The vast majority of Warehousing & Distribution for New York City and East-of-Hudson destinations is conducted in New Jersey. As it stands today, all of that freight must cross the Hudson River and East River, being funneled onto a limited number of bridges - and using trucks.At the very heart of the issue - and the driving force behind virtually every topic to be addressed on this website hereafter - is the fact that Northern New Jersey serves as the primary warehousing and distribution center for New York City and Long Island, an area known as the "East-of-Hudson" region. As well, New Jersey conducts the warehousing and distribution functions for much of the New York Metropolitan Area, and a great portion of the entire East Coast. Simply put? New Jersey has ample access to freight rail because there are no natural barriers disconnecting it from the national freight railroad network, a luxury not afforded to the East-of-Hudson region due to one primary obstacle: The Hudson River. As a result, over 90% of the goods and commodities imported to New York City and Long Island are carried via truck and over our suspension bridges. Much to New Jersey's credit, the state is an absolute powerhouse when it comes to industrial functions, particularly warehousing and distribution. In 2007, more than 920 Million tons of freight moved through a 54-county modeling study area as outlined by the Cross Harbor Freight Program Needs Assessment, September 2010 (Click Here for link), conducted by the United States Department of Transportation and the Port Authority of NY & NJ. Much of that 920 Million tons of freight was delivered, warehoused, and re-distributed to points all over the East Coast, including the East-of-Hudson region. By 2035, that 920 Million tons of freight is projected to grow to 1.2 BILLION tons of freight. While the friendly, tongue-in-cheek rivalry between New York and New Jersey will lead many New Yorkers to dismiss New Jersey as an "industrial center", the fact of the matter is that we can't escape the fact New York is essentially an archipelago of islands that is connected to the mainland United States by a very limited number of bridges and tunnels spanning the Hudson River and East River - and into New Jersey. We are almost completely reliant on New Jersey to receive, warehouse, and re-distribute all of the goods and commodities New York City and Long Island consume on a daily basis. In this logistics schema, all of the cargo the East-of-Hudson region imports has to be trucked over the rivers from New Jersey, as there is no rail option. No bridge or tunnel exists that will allow a freight train to cross the Hudson River directly from Northern New Jersey to New York and/or Long Island (the passenger tunnels through Penn Station are incapable of handling freight trains). The severity of this situation is truly unfortunate for the East-of-Hudson region, as a single freight railcar can carry the payload of FOUR semi tractor-trailers, and trains don't clog the highways and roadways like slow, heavy trucks do. New York City and the East-of-Hudson region are completely unable to reap the benefits of freight rail logistics simply because we don't have the infrastructure in place to do so. This is why it is crucially important that the proposed Cross Harbor Freight Tunnel (info link) is constructed, and we will address this later. As 2035 approaches and that 1.2 BILLION freight-tons figure becomes a reality, the construction of a freight railroad tunnel will become ever the more urgent. Let's hope it's not too late. Who will take the lead? 93.2% of the East-of-Hudson region's freight is imported by trucks, both semi tractor-trailers and smaller trucks. This figure represents the highest rate for dependency on truck logistics in the nation. Not a good idea for an "island region" like New York.Without question, trucks form the backbone of the nation's transportation network along with freight rail. In fact, the trucking industry and railroad industry often work together to move goods from Point A to Point B. In a concept known as "intermodal service", truck trailers and shipping containers are placed on railroad flatcars, then offloaded close to their final destination for the last leg of the journey. 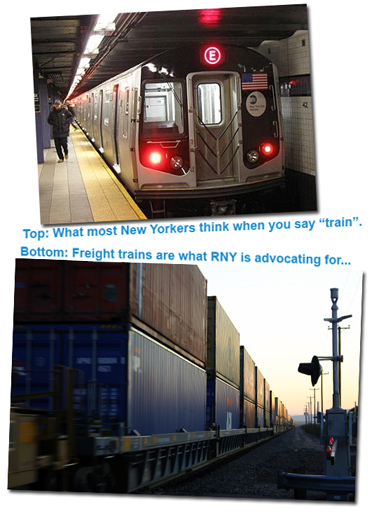 There is nothing inherently wrong with trucks, and the people behind Rail New York have great respect for the industry. However, it is very problematic when your regional transportation strategy is over 90% dependent on trucks - and trucks only - to deliver goods and commodities, especially within an island city with few bridge crossings, severe traffic congestion, and a crumbling infrastructure. Worsening the problem, only a few of those already-limited bridge crossings are capable of handling 53' semi trailers, the new standard in the industry. The George Washington Bridge (GWB) is the only river crossing that is part of the national highway system, and thus the only bridge that can accommodate 53' truck trailers. The Throgs Neck Bridge can host 53' trailers as well, but only after the trucks negotiate the myriad of crowded and decaying highways in the Bronx - and then again only during certain hours of the day. As somewhat of a silver lining, 53' trailers are primarily used for long-haul logistics moves, as in cross-country, and are destined to warehouses in New Jersey to begin with. 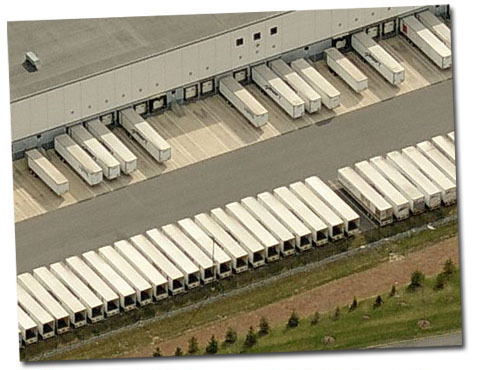 Many of the trucks delivering goods from warehouses in New Jersey are smaller trucks (i.e. not tractor-trailers) and can negotiate most, if not all, of the bridges and tunnels in the New York region. However, even these smaller trucks spew noxious diesel fumes, crowd our highways, cause stress-inducing traffic jams, tear up our already-deteriorating highway and roadway infrastructure, and compromise public health and safety. The issue with over-reliance on trucks in New York City and Long Island, however, centers on the fact that a whopping 93.2% of cargo that Gotham and Long Island imports is brought in by truck, a troubling statistic that gives us the dubious distinction of being the most truck-dependent metropolitan area in the nation. When you consider the very few roadway bridges connecting the city and Long Island to the mainland United States, with the George Washington and Throgs Neck bridges being the only crossings capable of handling 53' truck trailers (standard in the industry), you will instantly recognize the problems we have in store for us. Did we even mention the increase in demand for commodities imported to this island city that will make conditions even worse if we continue to sit on our hands (and stuck on the roads)? Ready for your commute home? If freight rail doesn't become a larger part of the logistics strategy in New York City and Long Island, this is what we'll be facing every day as an even greater number of trucks crowd our highways. 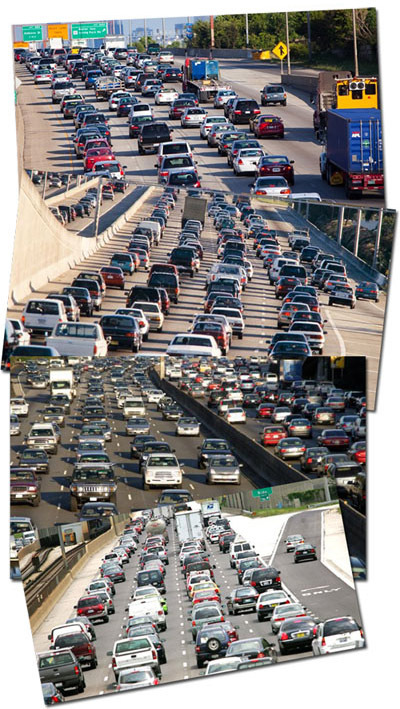 Is this the life you want?Perhaps the most compelling reason to our casual website viewers is increased traffic congestion due to our region's self-destructive logistics strategy. As it stands, traffic jams in the region are all too common - especially during peak commuter hours. Just imagine how conditions will be in the future given population growth projections, coupled with a concurrent increase in demand for the goods and commodities imported to geographic Long Island, which includes Queens and Brooklyn as well as Nassau and Suffolk counties. Currently, many of the region's highways are operating at a shocking 40% to 100% above their intended capacity, meaning that some regional highways are handling DOUBLE the amount of traffic they were designed to accommodate. Startling isn't it? Then again, maybe not so startling when you consider how many times you've been stuck in traffic, whether on your way to work or on your commute home. Even more troubling? Conditions will only get worse if more trucks are placed on the highway instead of railcars placed on railroad tracks. Something to ponder the next time you're stuck in traffic instead of being home spending quality time with your family. Why should we have to deal with this? Part of these traffic congestion problems stem from the limited number of highway and roadway crossings that connect the East-of-Hudson market with the mainland United States. 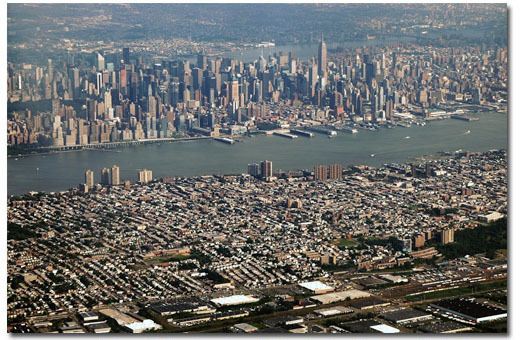 Based on 2010 United States Census estimates, the combined population of all four counties on geographic Long Island (Queens, Brooklyn/Kings, Nassau and Suffolk) is 7,623,745 people. That's over 7.5 million people, or approximately one-third the population of the entire New York CMSA (Consolidated Metropolitan Statistical Area). This figure is surely to grow with future population growth, both natural births and immigration. As we all know, New York is a region particularly popular with immigrant population expansion. This ever-growing population is currently served by a limited number of bridges connecting us to the mainland: the Verrazano Narrows, George Washington, Triboro (RFK), Whitestone and Throgs Neck bridges. In addition to hosting commuters and passenger vehicles, these bridges are burdened with an ongoing parade of trucks - both long-haul and short-haul, that deliver the food, clothes, groceries, furniture, appliances, construction materials, gasoline, toys, electronics, various household items and other commodities that the nearly 8 million people on the island need to sustain their lifestyle. Six of the top ten cargo-importing counties in the Cross Harbor Freight Program Needs Assessment's 54-county regional modeling area were east of the Hudson River, meaning cargo destined to six of the "top ten" counties had to cross over the aforementioned river crossings. Projections from that same study indicate that in 2007, 10 Million vehicles crossed the George Washington Bridge. In 2035, that number is expected to meet or exceed 14 Million vehicles - a startling 35% increase. The Verrazano Narrows Narrows Bridge saw 5.7 Million vehicles in 2007, and is predicted to host 7.4 Million vehicles by 2035. How can these bridges keep up? They are already struggling to handle traffic volumes 40 to 100 percent OVER their intended carrying capacity, and traffic volumes are only projected to increase. Are we on the verge of a major meltdown? Will the worsening traffic jams devolve into absolute 24/7 gridlock? We didn't even mention increasing bridge tolls, did we? We'll save that for another day. It is Rail New York's position - and common sense, really - that importing and exporting a greater proportion of the island's commodities using freight trains will go a long way towards reducing the number of trucks on the highways and bridges and, resultingly, reduce the overall traffic the region must deal with. Which sounds like the better option? What happens when you place a disproportionate number of trucks on our roads, highways and bridges? Increased traffic, particularly caused by heavy trucks, quickly tears apart the highways, roadways and bridges in New York City and Long Island. Added traffic means the cost to maintain infrastructure increases. It's no secret to anyone who has driven the roads of New York City, Long Island and New Jersey that our roadway infrastructure is crumbling. In addition to the limited capacity issues listed above, the physical plant of our roadway infrastructure is in a state of disrepair, and maintenance departments are always involved in an ongoing effort to "band-aid" or "patch" the many potholes, divots, cracks and other damage to the roads. Want even more traffic congestion? Let's close a few lanes and merge four lanes of traffic into two lanes while maintenance crews perform road work. Honestly, when have our roads ever not been under construction? It's not only an inconvenience for you to travel on damaged roads full of potholes, but the roadway damage also takes a toll on your personal vehicle - your tires, shock absorbers, and other components of your personal vehicle are subject to greater wear and tear due to the rough condition and state of disrepair of our roads and highways. 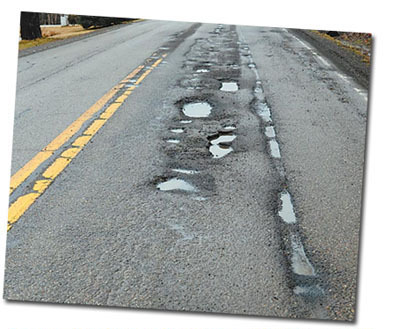 In addition to costing the state and local municipalities money to repair the roads (which will only be damaged again in a few months), it costs YOU money to repair your vehicle from the damage it sustains from all the potholes, craters, striations, and other damage that heavy trucks inflict on our highways and local roads. Let's not forget the wear on your brakes due to you being stuck in traffic while crews repair the roads and highways. The infrastructure damage inflicted by the East-of-Hudson region's over-dependence on trucks is not just limited to the roadways, and not just limited to New York. As mentioned above, the limited number of bridges and tunnels spanning the Hudson River and East River are also suffering under immense stress, burdened by a disproportionate number of heavy trucks that must bring goods and commodities to geographic Long Island by virtue of the region's warehousing and distribution functions being primarily located in Northern New Jersey instead of on geographic Long Island itself. Is this fair to the people of New Jersey? (let's put regional "rivalries" aside for just a moment) According to the North Jersey Transit Planning Authority (NJTPA), 33% of New Jersey's roads and highways are considered "functionally obsolete", and 11% "structurally deficient". Over the next 25 years, more than $661 BILLION will be needed to maintain and operate the regional highway system. Still not convinced? Based on 1997 estimates from a report produced by the Federal Highway Administration (FHWA), the estimated cost of pavement wear caused by trucks is up to 100 times greater than that caused by passenger vehicles. An incredible figure, particularly in light of the fact that one single railcar in a freight train can carry the same payload as FOUR tractor-trailers, and freight trains don't use our roadway or highway system. The solution is clear: Freight trains, once again, are the answer to regional infrastructure decay. The region needs to do everything it can to promote and incentivize a much greater use of freight rail logistics on geographic Long Island. We're not talking "token improvements", we're talking a complete revolution in our logistics strategy. Crisp, beautiful days in New York City - such as pictured above - will be harder to come by if the East-of-Hudson region does not change its logistics strategy from trucks and increase its reliance on freight rail.New York City is very lucky when it comes to air pollution rankings. For as big as Gotham is, and being the largest metropolitan area in the nation, New York ranks #15 when it comes to Ozone pollution as ranked by the 2012 figures of the American Lung Association. Even more to our advantage, New York doesn't even rank in the top 25 when it comes to year-round particle pollution and short-term particle pollution. This is absolutely great news, and we are proud the city stands in such good ranking. As we mentioned earlier, Rail New York refuses to employ scare tactics like other organizations (such as extremist fringe groups like CURES) to make its point. To what do we owe this good fortune? Mass transit - the city's reliance on subways, commuter trains such as the LIRR, Metro North and NJ Transit, and the region's extensive bus system, all of which are beyond compare. 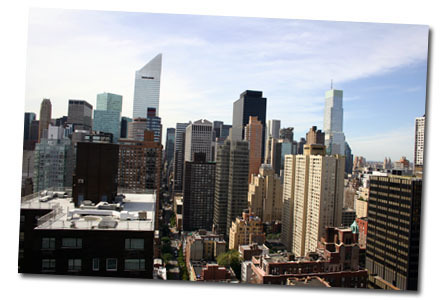 New York City is not an overly-car dependent city like Los Angeles, Atlanta, Dallas, Houston and other "sunbelt" cities. The city's commitment to mass transit must be applauded, as evidenced by New York's excellent rankings when it comes to air pollution. What better authority than the American Lung Association to tell us this? There could be problems down the road, however, given future growth projections within the region and particularly on geographic Long Island. If projections hold true, and an even greater number of emissions-spewing trucks are placed on our roads, New York's excellent ranking when it comes to air quality could begin to slip. This will obviously hold negative consequences for public health, and increase a bevy of health issues such as asthma rates and other respiratory conditions. If the freight logistics strategy in the East-of-Hudson region does not change, and we continue to remain almost 95% dependent on trucks, public health and safety will be compromised. Rising asthma rates, cancer rates, vehicular accidents, injuries and deaths will become all the more common if we don't switch to rail solutions. The category of "Public Health and Safety" spans a variety of issues, mainly health issues caused by a multitude of factors relating to increased traffic and air pollution, which we discussed above. We created a separate category for the following articles as they relate to all of the issues we discussed above. Let's take a look at how a truck-dependent New York City and Long Island could suffer major public health and safety problems if we ignore freight rail and continue to be so dependent on trucks. We reference a variety of studies and articles to make our case. (Click Here to Read Article) According to researchers in Denmark, "Scientists studied more than 50,000 50- to 64-year-olds in two of Denmark's largest cities, Copenhagen and Aarhus, keeping track of many aspects of their health, including everywhere they lived for a 10-year period. Based on the locations of their homes and an analysis of traffic patterns, [Researchers] calculated how much noise each person had been exposed to. Of the people in the study, 1,600 had their first heart attack during the decade of the research." While stress induced from traffic noise is considered the main culprit, another factor being taken into consideration are particles in the polluted air damaging heart and blood vessels. (Click Here to Read Article) The World Health Organization ruled that diesel exhaust (heightened in an overly truck-dependent city like New York) causes cancer. The United States government has classified diesel exhaust as a likely carcinogen, with effects akin to second-hand smoke. According to the article, "It's on the same order of magnitude as passive smoking," said Kurt Straif, director of the IARC department that evaluates cancer risks. "This could be another big push for countries to clean up exhaust from diesel engines." Since so many people are exposed to exhaust, Straif said there could be many cases of lung cancer connected to the contaminant. He said the fumes affected groups including pedestrians on the street, ship passengers and crew, railroad workers, truck drivers, mechanics, miners and people operating heavy machinery." This is all the more reason to take trucks off the highway and bring freight trains in, as a single freight railcar can carry the payload of four trucks, and using much less fuel. Isn't this simply common sense? (Click Here to Read Article) "Fine atmospheric particles — smaller than one-thirtieth of the diameter of a human hair — were identified more than 20 years ago as the most lethal of the widely dispersed air pollutants in the United States. Linked to both heart and lung disease, they kill an estimated 50,000 Americans each year. But more recently, scientists have been puzzled to learn that a subset of these particles, called secondary organic aerosols, has a greater total mass, and is thus more dangerous, than previously understood." - This article is indeed an interesting read that offers more reasons why we shouldn't have four times the amount of high-polluting trucks on our highways, and instead we should have freight rail locomotives importing a greater share of geographic Long Island's commodities. (Click Here to Read Article) "The impact of pollution on the heart and brain was seen over both the short and the long term. One nationwide study that followed nearly 20,000 women over a decade found that breathing in levels of polluted air like those commonly found in most parts of the country greatly accelerates declines in measures of memory and attention span. Another study in Boston found that on days when concentrations of traffic pollutants went up, so did the risk of stroke. The odds climbed by more than 30 percent even on days classified by the federal air quality index as "moderate" pollution days, which is intended to correspond to a minimal danger to health. "At levels that the Environmental Protection Agency says are safe, we're seeing real health effects," said Gregory A. Wellenius, an associate professor of epidemiology at Brown University and lead author of the study linking pollution to stroke. "We saw these effects within 12 to 14 hours of when pollution levels went up." "A new report from the New York City Community Air Survey (NYCCAS) shows that four major pollutants are heavily concentrated in high-traffic areas such as Midtown and Lower Manhattan, as well as parts of the Bronx, Brooklyn, Queens and Staten Island that run along busy freeways. 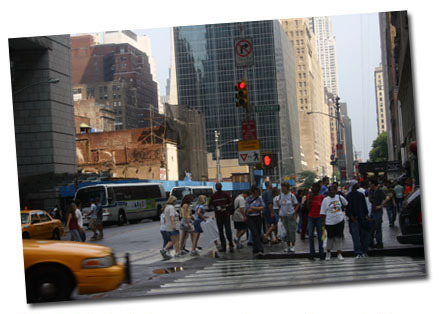 The report – Results from Summer Monitoring 2009 – is the city's first comprehensive analysis of summertime air quality at the street level. Another recent NYCCAS report identified heating oil as a major contributor to wintertime air pollution, but the new report points to motor-vehicle traffic as a key local source of street level pollution during the summer. 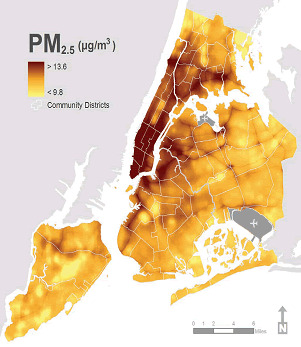 The findings show that summertime levels of fine-particle pollution, also known as PM2.5, vary two-fold or more across NYC neighborhoods – as do concentrations of elemental carbon, nitric oxide, nitrogen dioxide and ozone. Most of the major summertime pollutants are concentrated in densely populated areas, where traffic is more congested and where more fuel is used for cooking and water heating. The study found that areas with the greatest traffic density had three times the concentration of nitric oxide, and twice the concentration of nitrogen dioxide, as areas with the lowest traffic density. PM2.5 follows a similar pattern." - All the more reason to reduce traffic by taking high-polluting trucks off the region's highways, and increasing the use of freight rail logistics in New York City and geographic Long Island. (Read Article Here) "Incidents of road rage were cited as a factor in 2/3rds of highway deaths in 1996. A study by the AAA Foundation for Traffic Safety found that "violent, aggressive driving" increased 7% per year since 1990. As the roads become increasingly crowded with vehicles, the incidences of road rage only escalate. In fact, traffic has increased 35% since 1987, but there are only 1% more new roads to support that traffic."